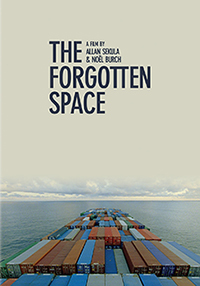 The "forgotten space" of Allan Sekula and Noël Burch's essay film is the sea, the oceans through which 90% of the world's cargo now passes. At the heart of this space is the container box, which, since its invention in the 1950s, has become one of the most important mechanisms for the global spread of capitalism. The film follows the container box along the international supply chain, from ships to barges, trains, and trucks, mapping the byzantine networks that connect producers to consumers (and more and more frequently, producing nations to consuming ones). Visiting the major ports of Rotterdam, Los Angeles, Hong Kong, Guangdong province, and many places between, it connects the economic puzzle pieces that corporations and governments would prefer remain scattered. We meet people who have been reduced to cogs in this increasingly automated machine - the invisible laborers who staff the cargo ships, steer the barges, drive the trucks, and migrate to the factories, and whose low wages form the base of the entire enterprise. The film also introduces us to those who this system's efficiency has marginalized: the longtime unemployed occupants of a California tent city, Dutch farmers whose land is bisected by a new high-speed train line, and the displaced residents of Doel, Belgium, whose city is slated for demolition in order to expand the port of Antwerp. Employing a wide range of materials and styles, from interviews to classic film clips, essayistic voiceover to observational footage, THE FORGOTTEN SPACE provides a panoramic portrait of the new global economy and a compelling argument about why it must change. Elsewhere: An epic journey through voices and sounds from elsewhere. Landscapes, outlooks on the world, outlooks on life: Desert, snow, valley, jungle, ice, rainforest. An homage to humanity at the beginning of the 21st Century. Dust: DUST turns one of the most commonplace subjects imaginable into a vehicle for a new appreciation of how these tiny particles affect our bodies and our environment and can provide a fresh new perspective of the entire world. The Ister: A journey up the Danube River, this film takes up some of the most challenging paths in Martin Heidegger's thought. With the philosophers Philippe Lacoue-Labarthe, Jean-Luc Nancy, Bernard Stiegler, and filmmaker Hans-Jürgen Syberberg. Our Daily Bread: A spectacular visual essay composed of epic tableaus, a haunting vision of our modern food industry, and the methods and technology utilized for mass production. The Way Things Go: 100 feet of physical interactions, chemical reactions, and precisely crafted chaos worthy of Rube Goldberg or Alfred Hitchcock - a discussion starter for sure.